The APEC Digital Opportunity Center (ADOC) Project, launched in 2005, aims to enhance capacity building of developing APEC economies in information and communication technology (ICT) and to transform the digital divide into opportunities. ADOC workshop 2012 was held in Chinese Taipei from July 10th to 11th, 2012. The event brought together representatives from many APEC member economics, including Chile, Indonesia, Malaysia, Mexico, Papua New Guinea, Peru, The Philippines, Russia, Thailand and Vietnam. ADOC Workshop’s primary goal was to promote the development and exchange of digital policies between APEC member economies in order to encourage the spread of ICT as a tool that can help overcome challenges and unleash potential digital opportunities, thus facilitating the road to an equitable digitalized society in APEC. The ADOC workshop 2012 featured the following sessions; 1) Developing ICT Capacity for Disadvantage Groups; 2) ICT Enabled Services Creating Digital Opportunities, and 3) Expansion of Services through enhanced Mobility. 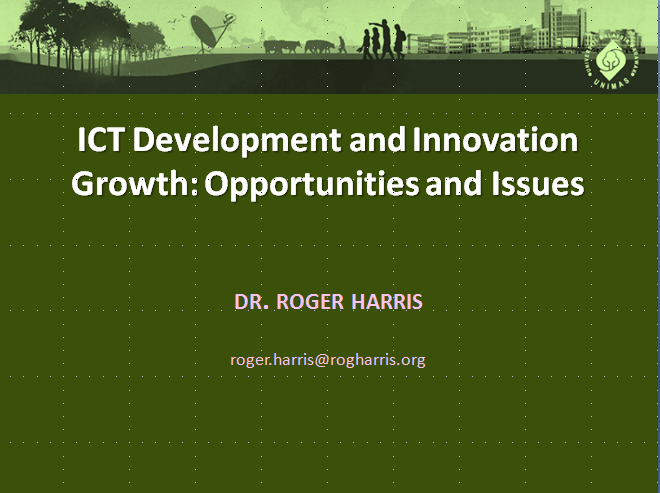 The presentation below was give by Dr. Harris.